Welcome to the United States National Official Monster Raving Loony Party webpage! We like to welcome you to a political party that's really a party--The United States Official Monster Raving Loony Party. First started by rocker Screaming Lord Sutch in England in 1963, we issue daft manifestos with a laugh and propose even dafter laws with a serious intent: to make people take action. If you ever watch C-Span during its public policy blocks, there might be the British General Election. 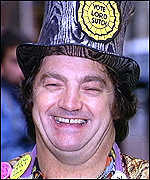 In one of the districts, there will bound to be someone with the audacity to wear a top hat, crazy ties, and a big honkin' button that says "VOTE LORD SUTCH" and he'd be smiling along. That's us. Now, we are here in America with even more enlightenment than you can shake a stick at. With the Clinton scandals, the peccadillos of politicians, and various etcetera, we believe it's high time to be Loony and hoist people by their petards. We'll be glad to welcome you aboard. To support the Party party, Loony merchandise is now available to purchase: T-SHIRTS ($10), LOONY BADGES ($1) AND LIFETIME MEMBERSHIPS ($10-includes a certificate of sanity, membership card, badges, etc.) If interested, print up this handy-dandy application form! THE UNITED STATES NATIONAL OFFICIAL MONSTER RAVING LOONY PARTY & celebration of the LOONITED NATIONS! SATURDAY, OCTOBER, 19, 2002, 6:00 P.M. until...? 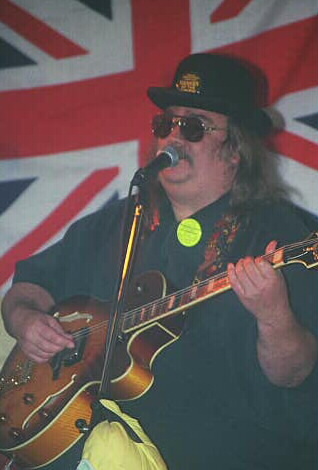 Live Music, Jollity, Merriment, Hillarity, Muse, Comedy, Jams (bring your axe or horn)! ATTIRE: Party colors are YELLOW and BLACK and PURPLE. One, or any combination of, will present you in proper attire. For the more adventurous loonys, any "mad-hatters" attire would be most suitable. Speaking of hats, hats are "in" (top hats, derbys, easter hats, halloween hats, whatever!). This is the alternative to seasonal Halloween parties. Be creative or come as you are. The foremost policy: put the party back into the Party! & lovely lady gertie gussett, Loonyada Captain Cutlass, and other guest starz from the u.k.
sir barny and rockin� renate from the new deutschen rock�n�roll und loony partei and ? This is a bring food & beverages to eat & share deal. Prizes for the best Loony attire and the best campaign poster! Sir Andrew Edd Banger and Lady Marlena Shaw are the head guys of our Party. They enjoy sailing and spreading Loony cheer in Florida. A full biography of us will be on our pages soon. If you like some more info, e-mail us and check out the Rock and Roll Loony Page! And please, check out our page often as we expand! 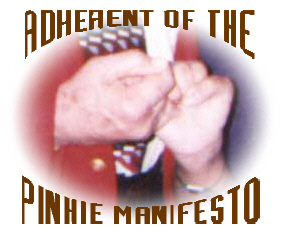 The Webmistress is the Founder of the Royal Order of the Pinkie Linker and Author of the Pinkie Manifesto. Webmistress' Comment: I believe that you can find Loonies in most Political Parties. I've encountered Loony Republicans, Loony Democrats, and I was taught by a Professor who's a Loony Libertarian! So if you're Loony and ya know it, join us, say it loud and say it proud!!! and do so in his wonderful spirit of humor and friendship!